As you're reading this, Shane and I are helping a moving company load six suitcases, five boxes, one large (FRAGILE!) TV and a couple of other miscellaneous gadgets in their respective boxes onto a single van which will transport all of these items to their new home. Our new home. It's the end of an era at 22 Nelson Street, the namesake of this very blog and the name tag associated with all the fuzzy, happy feelings we get when we think of the almost-three years we spent in this loving home. We found this home when Shane had just returned to the UK after our engagement to start his new job, and we spent hours browsing through property websites without really knowing what we were looking for. We just wanted an affordable, one bedroom starter-home that was close enough to his work so that he wouldn't have to spend time commuting. I now realize that that latter part was what mostly carried weight in our house-hunt psyches because this flat was a mere ten-minute walk from his work (and by extension, the city center) because of which, it was by no means affordable for the amenities that it came with. We struggled with lack of space, thin walls that gave me PTSD every time the couple downstairs had a screaming match, mold in the bathroom ceiling because of poor ventilation, lack of double glazing that froze our asses during the notorious Scottish winters, a broken boiler, and many other defects that I could ramble about forever. In fact, I did ramble in 2015 and you can read that post here. However, much like I did at the end of the post I just linked, I could also ramble forever about how this was our home and how it was just right for us. 22 Nelson Street was our perfect first home. It came with high ceilings, tall windows, gorgeous floor and ceiling trims, and a hell of a lot of character. It's a ground floor flat in a listed building that's definitely more than a hundred years old which means that a) it doesn't come with a lift, so you'd be expected to climb up to three flights of stairs depending on which floor your apartment was situated on and b) we never needed the lift in the first place, even when we were hauling heavy suitcases down the hall. But as you may have guessed, while we applaud the physical beauty and convenience of this flat, they would by no means be the things we'd remember in the long run. What we'd remember would be the memories. The memories of constantly bumping into each other in that tiny kitchen while we attempted to cook and the memories of recording my first ever podcast episode in our closet. The memories of screaming all the way from the bathroom to the bedroom to the closet within the bedroom to turn on the boiler that malfunctioned during a shower, of fighting for more space on that two-seater couch that barely fit the both of us, of recording videos of The Bromance snoring during a movie while seated on the other two-seater couch with his longs legs hanging off the edge, of walking straight out of the bedroom and into the kitchen in the morning without even brushing our teeth, of swearing at the only clothes rack that kept dropping and banging onto my head because I was too short to avoid that accident. It's these memories that I'll be walking you through in this house tour. So if you're here expecting to see a beautifully laid out home with all its cords and mess hidden, you're in for a disappointment. This was our first home and this is what it's looked like in the past three years. DISCLAIMER: The first 7 minutes of this video was recorded on a phone-camera and hence, has poor audio quality. Kindly forgive us noobs. 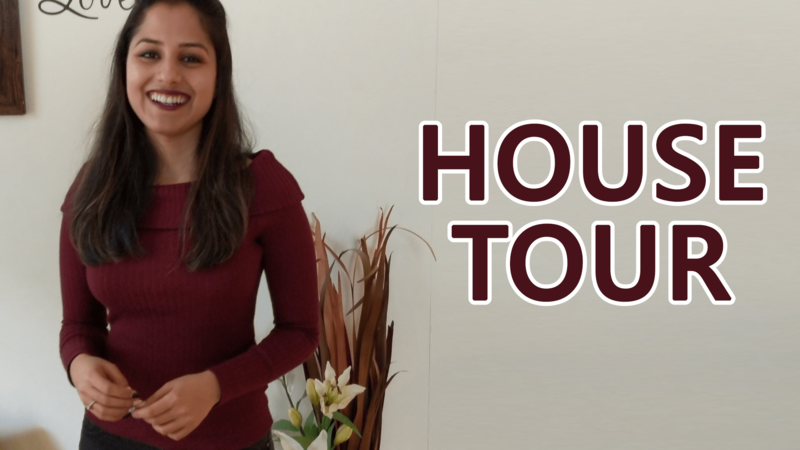 I will always go back and pat Ankita-from-one-month-ago on the back for deciding to record this house tour before starting the packing process. I'm a sucker for clinging on to happy memories and I would have been sorely disappointed in myself had I woken up one morning and struggled to recall details from our first home. So please excuse me as reach for a pack of tissues while re-watching this video from our rather spacious living room in the new house that will soon become another loving home. Here's to the end of one of the most beautiful chapters of our lives and to the beginning of one that we'll attempt to make just as beautiful.